When the Scion FR-S came out, I figured that was the end for the TC. I was all prepared to say a tearful goodbye. But wait a sec. What is this? A new TC coming next week? In the words of Moe Szyslak, "Whaaaaaaaaaaa?" 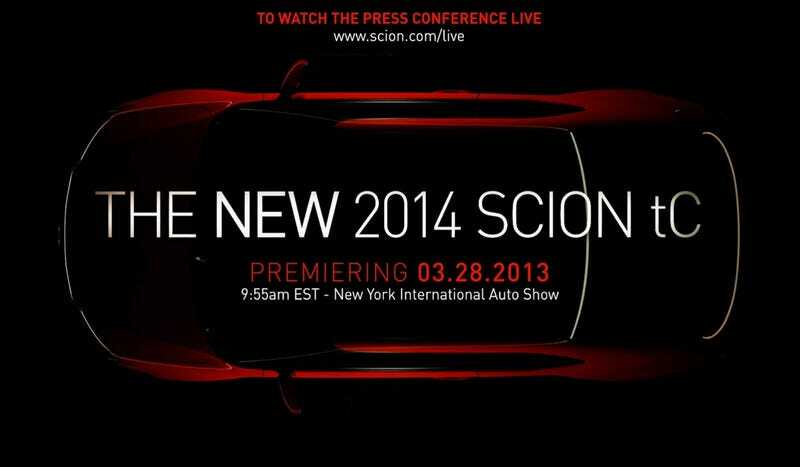 A new TC will debut next week at the NY Auto Show. We don't know if it's a fully new car or just a mild refresh, but this is a chance for Scion to do something new with the TC. Maybe it'll be a quirky hatch like the Hyundai Veloster? Perhaps it'll be a bit bigger and more usable to cater to the high school first car crowd? Or maybe it'll just have a new color and be slightly more boring? Or maybe it's a joke and they're actually just telling people to buy an FR-S instead of a TC. The dark overhead shot above looks a lot like the current car, so my hopes aren't very high for a radical, paradigm shifting change. Still, it sometimes pays to dream.